Easter Island is the most isolated place on the planet. Most people might think Antarctica is the most remote location on earth. It’s not. Easter Island is the most isolated place on the planet. It is located 2,300 miles west of Chile in the Southern Hemisphere and 2,500 miles east of Tahiti. I have always wanted to visit Easter Island. One day I was surfing the Internet when I came across an announcement for a triathlon on the island. This was perfect for me because I compete in one triathlon a year. I believe that by completing in one triathlon a year, the gods will grant him another year of health and happiness. This was my opportunity to visit Easter Island, which is best known for its 887 enormous monolithic statues known as the Moai statues. People visit from all over the world to marvel at these works of art. The Moai were made and moved from about 1000 AD to 1600 AD. Although known as Easter Island heads, they all have bodies and some have legs. Over the centuries, the statues were buried by shifting sands. One statue is 32 feet high and weighs 82 tons. The creation and transport of the Moai was an incredible achievement for primitive natives with only stone tools. Local legend has it that the statues walked out of the quarry to their present location. The Moai were created to honor deceased relatives. 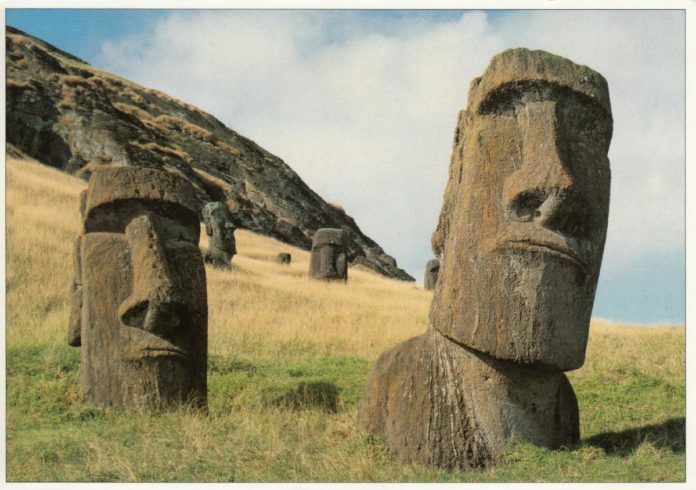 If someone wanted to insult another person, they would knock down the Moai honoring that person’s deceased relative. When the Europeans arrived in the 1700s, almost all of the Moai had been knocked down. Presently most of the upright Moai on Easter Island are the work of archeologists. The native population on Easter Island in the 1600s was estimated to be around 15,000. By 1800 it was only 111. The cause of the decreased of population is not known, but there are theories. One the most interesting theories is that all of the trees on the island were chopped down to make rollers to move the statues. Once the island was deforested, soil erosion occurred. Fruits and vegetables could no longer be grown and the natives could no longer make boats for fishing, leading to famine, war and cannibalism. Gillett is a board-certified ophthalmologist in McAllen.